Welcome to the future. If it wasn’t enough of a jolt to realize that 3rdTech is offering the $85,000 Nanomanipulator™ that allows you to manipulate individual molecules and atoms in 3D, or that IBM is makingnanotube transistors in the laboratory, then prepare for the real paradigm shift: Startup Nantero is developing NRAM™, a high-density nonvolatile random access memory chip, using nanotechnology. Specifically, they’re using nanotubes, which are long hollow molecules made up of carbon rings. Nanotubes are 100 times stronger than steel, hard as diamonds, and can conduct electricity as well as copper. Typical Nanotube diameter is approximately 100,000 times smaller than a human hair. (Don’t get me started on the varying estimates of the width of a human hair. In researching it, I found estimates that varied more than a thousandfold. I even found a tidbit that claimed Japanese hair is twice as thick as European hair. So that’s why they appear to be so much better at miniaturization! )The micrograph at right is of a similar memory array developed at MIT. Each square on the grid is 300 nanometers by 400 nanometers. If that’s not enough to knock your socks off, you must be wearing nanotube socks, perhaps made in Japan. Gunze Sangyo, Japan’s biggest men’s underwear maker in March unveiled a new process to make fabric using nanotubes. Their rough-edged nanotubes conduct heat more than twice as effectively as copper and would initially find uses in heat sinks to help keep microchips cool. The first device containing the nanotubes is expected to reach the market this year. The tubes are already in production at a joint venture, Nano Graphite Materials Inc, in Ohio. Other companies and researchers are trying to create nanomachines, also known as MicroElectroMechanical Systems (MEMS). In fact one MEMS company,Coventor, a provider of MEMS software, ranked 152 on the Inc 500 list of fastest growing companies in the US, experiencing a 1739% increase in sales over five years. I particularly like one of the phrases from Coventor’s Web site: “we work aggressively with customers to summon the future and wire it for power.” O, Future! I summon thee! By now you get the idea that nanotechnology is far from science fiction. It’s here, in production, and revolutionizing many industries. I’ve just scratched the surface here, and haven’t even talked about important nanotechnology concepts like self-replication. (For a glimpse of what a future driven by nanotech might look like, I heartily recommend two books: Neal Stephenson’s The Diamond Age, and William Gibson’s Virtual Light.) Companies who make things for a living need to be aware of the challenges posed by new advances in nanotechnology. Even those who make such old tech products as ball bearings need to be aware. The picture at the left represents a concept of ananoscale ball bearing, which might have the capability to accelerate from zero to 500 billion revolutions per second in a fraction of a nanosecond. No one’s building it yet, but just wait. Coordinated Cyberattacks Stopped on 9/10/01: This item belongs in the Very Strange Coincidence Department. According to California Attorney General Bill Lockyer, well-coordinated cyberattacks that targeted computers in California and 21 countries over three months ended abruptly on September 10th in an eerie prelude to the terror attacks of the 11th. Lockyer said the 120 attacks attempted to strike university, business and government agency computers and were systematic, extensive and appeared to be government sponsored.“There’s a lot of hacking that goes on that’s not this disruptive or expensive,” Lockyer said.“This was notable in that it was sophisticated enough to be beyond the capacity of ordinary hackers. So it suggests that there’s actual government involvement on the other end.”The state is working with the FBI to investigate the attacks. Alert SNS Reader Larry Kuhn (speaking for himself and not his employer) points out that Microsoft is not the only operating system maker plagued by security problems. This is certainly true, and is a point I have made repeatedly in the past. However, it can’t be stressed enough that just because you follow my advice and don’t expose Microsoft OSes to the Internet, you can’t be complacent. As I always say, if you’re not terrified about security, you’re not paying attention. Now I’m a little skeptical of the numbers, and wonder, as did a responder to the article in TechRepublic’s talkback forum, if a raw bug count is really all that relevant. Of more importance is the amount of time for the vulnerability to get fixed, the severity of the vulnerability (is it in the wild, or theoretical? ), and the source of the bug report (was it found through a code review or because it has been actively used to circumvent security?). The poster asserts that closed source vulnerabilities (like Microsoft’s) are almost always found because someone has compromised the service, since there is no independent review of the code as there is in Open Source Software. Nonetheless, the results underscore Larry’s point: “People shouldn’t feel safer only because they’re using a non-MS OS. I think that’s the only meaningful conclusion that can be drawn from this article. IMHO, there are non-technical folks at the CxO level who read stuff like the Gartner recommendation to ditch IIS and mistakenly come to believe that the same type of risks aren’t possible in the alternative environments.” I couldn’t agree more. Just because you locked the front door doesn’t mean burglars can’t get in the windows (no pun intended! ö¿ð ). Incidentally, front page news at Security Focus is a report that a hacker named Beale Screamer has cracked Microsoft’s Digital Rights Management (DRM) copyright protection scheme which is planned for use in securing audio files. Another front page article reports that hackers can get users’ passwords from Cayman Systems’ popular 3220-H DSL router. Both these items underscore the need to not be complaisant or to feel that securing your computer OS is all you need to worry about. Larry points to an online tool you can use to assess the security of your system, the Microsoft Personal Security Advisor , written by folks right here in the Twin Cities, Shavlik Technologies , who make an enterprise version of the tool. The PSA will check the strength of your passwords and see if you’ve applied all the relevant security patches on your system. I think everyone in your enterprise should run it and act on its recommendations. The bottom line is, as much as I malign Microsoft, they’re by no means the only folks with security problems. Being the world’s most popular operating system means there are a lot more crackers out there trying to break their stuff, and that means their problems are ballyhooed in the press. But, hey, who said being a monopoly had to be fun? There are advantages to adopting Open Source Software for your Internet-exposed Web systems. Such systems are supported by fanatical, and I mean really fanatical, software zealots who consider it a point of pride to find and eradicate all bugs as quickly as possible. Even if Microsoft, or, heck, even Sun, for that matter, gets really serious about security, they will be hard pressed to match the dedication of OSS supporters. If you must use Microsoft software on the Internet, then you must accept as part of the Total Cost of Ownership (TCO) the responsibility to constantly update the software with the latest patches and to be eternally vigilant. In larger enterprises, this obligation can translate into dedicating one or more employees to the task. If you’re not terrified about security, you’re not paying attention. Do you know why your customers buy from you? Can you find prospective customers just like your current customers? Can you match your key products and services against products and services of your competitors? What are the strengths and weaknesses? Are you selling against them? Who are future purchasers of your products and services? What do they look like? Do you know why your customers are not buying from your competitors? Will changes in the economy have and influence your customer’s ability to purchase your products and services? How? Will changing demographics have an impact on your business? How? If your product or service is regulated will pending changes in legislation affect your profitability? How? Wireless Videoconferencing: Tandberg of Norway has announced one of the first videoconferencing products capable of running on an 802.11b Wireless LAN (WLAN). The Tandberg 1000 consists of an LCD screen with multiple network interfaces including IP, ISDN, and WLAN. In wireless mode, you only need to plug the power cord in the wall, and off you go. Of course, you’ll have to have a compatible wireless LAN running in your home or office first. The company envisions folks just grabbing it and toting it from office to office as the need for videoconferencing hits. The unit requires a PC/PCMCIA card that fits into the slot at the top and interfaces with your WLAN. Pricing starts at $5,490. And completely off the subject, who else thinks that looks like Ross Perot in the picture to the left? Life in Prison for Hacking? A new bill being considered in Congress calls for life in prison without a possibility of parole for people who engage in computer trespass, also known as hackers. The Anti-Terrorism Act , AKA the ‘‘Uniting and Strengthening America Act’’ or the ‘‘USA Act of 2001’’ has lots of folks up in arms about this provision. The Electronic Frontier Foundation has publicly condemned the bill for treating low-level computer intrusion against the government, already a crime under existing laws, as an act of terrorism. Let’s keep it together, people! Record Industry Profiteering: As if upping the penalties for hacking wasn’t enough, our friends at Recording Industry Association of America (RIAA) tried to glue a self-serving hacking-authorization amendment onto the Mom & Apple Pie, er, Uniting and Strengthening America Act. The amendment , authored by RIAA lobbyists, would have exempted any actions the RIAA would take to preserve their copyright from the anti-hacking provision. This means the RIAA would have carte blanche to attack anyone who tried to circumvent their copyright or Digital Rights Management (DRM) schemes. That’s pretty extreme, and we can be thankful the amendment was dropped. Cracking Attacks on Pace to Double: According to Carnegie Mellon University’s Computer Emergency Response Team/Coordination Center (CERT/CC), attacks on Internet computers should easily double the last year’s reported number. Already, the number of security incidents reported has reached 34,754, a 60% increase over the 21,756 incidents logged last year. We’re on a pace to see more than 46,000 reported security attacks, more than twice last year’s number. A Sound Link: US Robotics has released a cool gadget that sets up a wireless connection of up to 1,000 feet between your computer and stereo. So if you’re tired of listening to your MP3s (lawfully ripped from your own, fully licenced CDs, of course) on your dinky computer speakers, this $100 toy’s for you. In the wake of the terrorist attacks, many people have wondered if one of the new battlefronts will be cyberspace. In fact, in a previous SNS, I reported the cracking of a German Islamic extremist Web site and the posting of subscribers’ names on a Swiss server. How well are we prepared for infowar? And who will fight it? The NIPC and the InfraGard are responding to the requirements of Presidential Decision Directive (PDD) –63, which President Clinton created on May 22, 1998. The directive orders the strengthening of the nation’s defenses against emerging unconventional threats to the United States to include those involving terrorist acts, weapons of mass destruction, assaults on our critical infrastructures, and cyber-based attacks. PDD-63 calls for a national-level effort to assure the security of the increasingly vulnerable and interconnected infrastructures of the United States. While the FBI has called for managers of physical infrastructure to go to a high alert status, it may be even more important for networking and computer professionals to be on alert. This is because many physical infrastructure resources are controlled by computers, and the security of these computers has been compromised in the past. For example, several times this past spring, crackers attempted to gain access to the servers at California’s Independent System Operators (Cal-ISO), the agency that manages the state’s electrical supply and decides when rolling blackouts will occur. The crackers apparently got close to disrupting the flow of power in California during the rolling blackouts that occurred in May. Many pieces of critical infrastructure today are controlled by Supervisory Control And Data Acquisition (SCADA) systems, which are basically networked computer systems. Like any networked computer system, SCADA systems can be vulnerable to attacks. Some of these systems, like GE SmallWorld’s PowerOn ™ electrical distribution system or Encorps Virtual Power Plant power dispatching system, are based on Microsoft Windows products, and many have Internet-enabled features (using Microsoft’s Internet Information Server (IIS)) for convenience. IIS security vulnerabilities are not even newsworthy anymore as they are discovered almost weekly . . . As Gartner warned in 1999, pulling complex application software into operating system software represents a substantial security risk . . . Microsoft has discussed its Secure Windows Initiative, which details a well-thought-out program for improving Microsoft’s development processes to avoid repeating the same security mistakes that led to vulnerabilities in Windows NT and Windows 2000. However, the same old buffer overflow problems appearing in beta Windows XP code raises doubts over whether the security assurance tools Microsoft has implemented will effectively reduce the number of well-known security bugs that continue to show up in Microsoft products. For Microsoft’s vision of .NET and Web services to succeed, Windows XP will have to be significantly more secure than Windows 2000 has proven to be; otherwise, Microsoft risks losing some enterprise business to more-secure implementations of Web services. To reduce their vulnerability, Windows-based SCADA systems may be hardened and protected by third party software, such as that available from Visual Automation . But the fact remains that many critical infrastructure systems are run by software from a vendor that has, to date, had serious problems with security vulnerabilities. And that makes me, for one, more than a little worried. It’s one thing for Web sites to be hacked. Even if the companies attacked lose millions, it’s only money. It’s yet another thing for critical infrastructure systems to be attacked, by joyriding script kiddies or by terrorists; the result could be disastrous. Here’s hoping the newly created Homeland Security Agency will act to bolster groups like InfraGard and will issue strong new guidelines for the use and protection of the software that controls vital services. Use strong passwords. Choose passwords that are difficult or impossible to guess. Give different passwords to all accounts. Make regular backups of critical data. Backups must be made at least once each day. Larger organizations should perform a full backup weekly and incremental backups every day. At least once a month the backup media should be verified. Use virus protection software. That means three things: having it on your computer in the first place, checking daily for new virus signature updates, and then actually scanning all the files on your computer periodically. Do not keep computers online when not in use. Either shut them off or physically disconnect them from Internet connection. Do not open email attachments from strangers, regardless of how enticing the Subject Line or attachment may be. Be suspicious of any unexpected email attachment from someone you do know because it may have been sent without that person’s knowledge from an infected machine. Regularly download security patches from your software vendors. Record every action you take. Include the date and time. Preserve evidence, no matter how small. Think prosecution–every action you take should help build a possible court case against the perpetrators. Limit the scope of the attack as quickly as possible. Preserve all audits (disable any system log purges or overwrites). Implement additional security, if necessary or available. You may be wondering whether you’ll be able to prosecute even if you catch the criminals. The National Security Institute maintains a list of computer crime laws by state. And hey, hey, hey! Let’s be careful out there! determine what people want]. You can see it in the faces of people on the street. People are really tender right now. They don’t want to be presented with advertising that is too in-your-face.” Words to remember if you’re planning an advertising campaign. Stan’s newsletter, The Coaching Connection, offers tips on self-improvement and performance optimization as well as business and marketing tips. I heartily recommend it. Toshiba Rolls Out Handheld: Last week, Toshiba became the latest vendor to embrace Microsoft’s Personal Digital Assistant (PDA) Pocket PC platform. Microsoft also announced its latest revision of the system, dubbed Pocket PC 2002, available now. This is the first year-named product that Microsoft has released ahead of the year, as far as I can remember. Toshiba, on the other hand, doesn’t even mention their new product on their US Web site. Now that’s a great way to roll out a brand new product! While many industry analysts predict Microsoft will continue to take share from Palm, the price and still-poor usability will slow their momentum. The Palm platform got a boost recently when Samsung rolled out a new color PDA/cell phone for use on Sprint’s cellular network. The unit uses the Palm operating system, comes with 8MB of memory and supports Wireless Application Protocol (WAP), HTML and i-mode’s cHTML. First US GPRS Network Expands: AT&T, which established the first General Packet Radio System (GPRS) cellular network in Seattle a few months ago, is expanding the network to three more cities: Las Vegas, Phoenix and Portland. Unlike the Seattle area, coverage in these new cities seems to be fairly extensive. GPRS offers voice and data, with data speeds as high as 144 Kbps. Typical performance, however, is likely to be 56Kbps, the speed of today’s wireline modems. The company said it’ll roll out Detroit in the next few weeks, serve about 40 percent of current customers with GPRS by the end of the year, and serve all its markets by the end of 2002. Are U Ready 4 a New Buzzword? Let’s see. We’ve had eBusiness and e-Tail (stupid buzzword alert), eCommerce and m-Commerce (mobile commerce). Next, we’ll start hearing about u-Commerce, or ubiquitous, universal commerce. In the future, according to Accenture’s think tank, Accenture Institute for Strategic Change, you can wirelessly buy anything from anyone anywhere in the world. (Lest we get too starry-eyed, we need to realize there are places in the world where livestock is the only going currency.) The company predicts 630 percent growth worldwide for net-connected wireless devices over the next four years. Despite its breathlessness, I more or less agree with this forecast. As I’ve predicted in the TrendSpot , I fully expect ubiquitous computing, where computing becomes not a place you go, but a service you get from your environment, to arrive by the end of the decade. Local area networking schemes like 802.11b (or successors) and Bluetooth are starting to make this happen today. Will this new acronym stick? Well, a casual perusal of the Web using Google turns up some supporters: Visa (who apparently coined the buzzword), the Association for Computing Machinery , and South Africa’s McCarthy Online . How Can You Be In Two Places At Once, When You’re Not Anywhere At All? A company called Teleportec has the coolest technology I’ve seen in a long while. 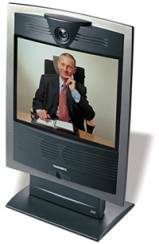 Using three ISDN lines (roughly 384Kbps), a person using their $70,000 Teleportec Podium can project his or her image from the waist up to a remote location and appear lifesized and in 3D. Only one of the men in the picture to the left is really there; the other is hundreds of miles away. The company has tried it out with several businesses. It also makes a large Teleportec Theatre that is 20 feet across with an 11 foot wide “teleportation zone” designed for panel discussions or telemeetings. Given the recent events, all kinds of virtual meeting technology will likely be given a boost (witness WebEx’s 30 percent stock rise on the first day of trading after the terrorist attacks). If Teleportec’s technology is as good as they say it is, look for them to put the others in the shade quicker than you can say, “Help me, Obie-Wan!” The applications aren’t limited to distance learning and business conferencing, however, as illustrated by the Digie award given Teleportec by Realcomm, a realty eCommerce conference. Unsafe At Any Speed? Alert SNS Reader Bill Lehnertz sent along a pointer to a McKinsey Quarterly article, How Fast is Too Fast? It’s a nice analysis of the “Internet time” mania that gripped many of the dot-coms. The authors studied 80 Internet companies, including business-to-consumer (B2C) companies, business-to-business (B2B) companies, and infrastructure providers. They tried to determine the speed with which each built its business—and the outcome. One of the companies examined is my favorite dot-com/exchange success story: Altra Energy. The PC is emerging as a personal server that supports a user’s mobile devices, often through its wired Internet connection. This is an interesting new trend, an extension of the PC’s role in synching contact and calendar information. For example, SimpleDevices downloads music to the PC and transmits the audio files wirelessly to the user’s car when it is within range. How cool is that? Nielsen notes that although SimpleDevices can’t support real-time news, it does offer a virtual broadband connection to the car. Cheap humans add value to the network. (Editorial Aside: One of the problems of this world is that there are cheap humans, IMHO). “Copytalk and Webhelp both presented ingenious ways of injecting full intelligence into a mobile system,” Nielsen said. “Users simply speak their information request; the system then compresses the audio recording into a data file and transmits it through the Internet, to locations where highly qualified labor is virtually free.” This makes possible all kinds of services, such as a human-powered AskJeeves -like service. According to Nielsen, a human expert at web searching could research the user’s question and transmit the answer back for less than a dollar. Once the answer arrives, it can be converted to speech using text-to-speech synthesis and played for the user. Whether the Danger device becomes the next big thing here will depend a lot on the progress of GSM and its successor, GPRS, in the US. With the first GPRS networks launched recently in China, England, and, incredibly, Seattle , the pervasiveness of this particular device will depend a lot on how quickly wireless network providers build out their networks. Nokia Covering Its Bets: As reported in issues of SNS (here and here ), Nokia is very interested in m-commerce (mobile eCommerce). In addition to its joint SmartCover effort with Sodexho and its dual chip test with Visa, Nokia is collaborating with IBM, Luottokunta and Radiolinja to pilot secure credit card payments using a mobile phone wallet application. The participants hope to demonstrate using the wallet for transferring payments and loyalty program information, and WIM (Wireless Identity Module) for making non-repudiated transactions. The parties are in the process of choosing suitable merchants for the pilot, which will start in the fourth quarter of 2001 in Finland. Java on the Phone – Your Desktop Phone: By now my prediction last spring that it would be a while before we saw Java on mobile phones seems pretty ludicrous. 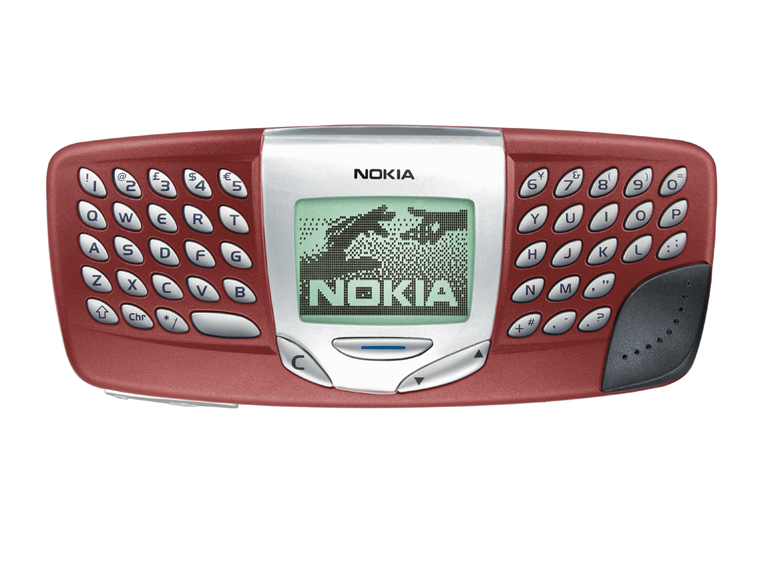 Not long after I made the prediction, Korea’s LG Telecom introduced a Java-enabled cell phone in July, Nextel announced a Java cell phone, and Nokia smart phones, available outside the United States, began using Java applications. Now Kada™ Systems has announced that Cisco will build their Java technology into its Voice over Internet Protocol (VoIP) non-mobile desktop phones. Sometimes the magic works, and sometimes it doesn’t. Sprint Stops Whining; Debuts E911 Phone: You never heard such a bunch of whining as the din put up by US wireless carriers about having to meet the FCC’s E911 mandate by this month. Verizon led the pack with detailed whines about how it couldn’t comply. VoiceStream got a waiver. But Sprint has amazed us all by offering an E911-compatible phone right on time. E911 is an FCC rule requiring cell phone network operators to be able to locate a phone within 100 meters. Although Sprint is offering the phone, Samsung’s SPH-N300 GPS-enabled phone, it is not yet supporting it with network services. Nonetheless, way to go! We will commit people and money to a development project that improves people’s lives. We will collaborate with colleagues–and competitors–to improve what we make and how we work.